They say a good friend is hard to find and they are right when they say that. When you do find a good friend, you should honor him and cherish the friendship. One of the ways in which you can show your appreciation of someone’s friendship is by giving them an Irish friendship ring. The concept of exchanging special rings between friends is not a new one. Rather the Celtics had this as a very prominent part of their culture more than three hundred years ago. This unique tradition has been continued by the people of Ireland so much so that it has become a world wide phenomenon today. The Irish developed a special ring known as the Claddagh ring to serve the purpose of a friendship ring. It is named so due to the region of its origin which was a small fishermen town known by the name of Claddagh. It was here that the culture of exchanging “friendship” rings developed. The unique symbolic design featured on the Irish friendship ring is today known around the world. Known as Claddagh the design was composed of a crowned heart held up in between to hands. The same design is available in many different forms and mediums today. One would consider this to be a rather unique and somewhat awkward symbol to be featured on a ring. The truth is that the three elements featured on the ring actually have deep symbolic meanings. The heart symbolizes the feelings of love which are present amongst two friends. The hands holding the heart are supposed to represent friendship, which is the key symbol of friendship rings. The crown is suggestive of loyalty which is something that exists only in between true friends. Hence the Irish friendship ring captured the essence of friendship that could exist between two people. The use of the Claddagh ring was not just restricted to friends. It was also the given choice to use as an engagement and wedding ring. In that case it would symbolize the coming together of two individuals in the sacred bond of marriage which requires love, friendship and loyalty to survive. With the passage of time the concept of Irish friendship rings has caught on. As improvements in mass communication brought this ancient tradition into the limelight it managed to win over the hearts and minds of a great section of the masses. As a result the demand for Irish friendship rings rose dramatically. Seeing this, all kinds of jewelers started to produce interesting varieties based on the Irish friendship ring theme. Today you will find the market to be loaded with umpteenth varieties of Irish friendship rings made using various materials such as gold, white gold, silver and platinum. They are further adorned with precious stones and intricate carving to appeal to the modern global market. 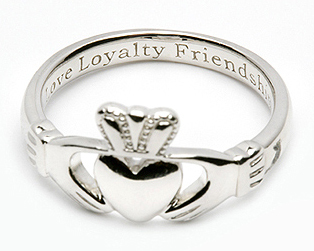 Not surprisingly, Irish friendship rings have managed to hit the mark with the masses looking for something unique to give to their loyal friends.